When's it too early to learn to code? When you're three perhaps? Well according to Fisher Price, that's exactly the time you should be encouraging your children to start. The toy company has created a new coding toy aimed at the class of 2035 that starts the journey into getting them to understand the foundational skills of coding, like thinking skills, problem solving, and sequencing. 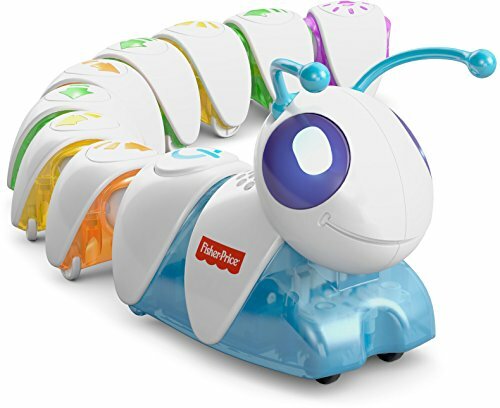 Called Think & Learn Code-A-Pillar, the new toy is a motorised caterpillar that comes with eight tail sections that can be snapped together in whatever order you want to perform a series of tasks like turning left, right, pause, straight on, or making all its lights flash. Costing around $50 when it becomes available later in the year, the easy to connect segments can be used can be added together in whatever sequence the kid seems fit to ensure that the Think & Learn Code-A-Pillar gets to where it's trying to go. Think Big-Trak, but with a caterpillar instead and set instruction pieces rather than punching numbers into a keypad. Fisher Price has confirmed to Pocket-lint that you'll be able to buy more segments too, so you effectively keep going and going, and because the power comes from four AA batteries in the head, it doesn't matter how many or how few a segments you use. A quick demo at CES proved to be great fun. The pieces easily slot together to create the caterpillar and then it whizzes off on the course you've told it to. The pieces themselves are clearly labelled, and as long as you can ensure the play space your child is big enough to enjoy their coding efforts, should be a great way of getting them to understand that actions have consequences. This is a really simply idea, that has been well executed, however we do understand that perhaps using the coding "moniker" is stretching the buzz word a little bit. Still it is about problem solving and that in a way is what programming or coding is all about. The Code-A-Pillar will be out in time for Christmas 2016 and is recommended for kids aged between 3-8 years.